10. The Romans ate an earlier form of pizza. Although the pizza we know today differs very much from the earlier form the Romans used to eat, there is a passage in the ‘War Commentaries of Caesar’ which depicts an episode in which the Roman troops were quite upset because of the fact that they didn’t get their daily ration of ‘pasta’. 9. A horseback trip from one end of the Roman Empire in A.D. 100 would have lasted about 100 days. The road had over 3,000 Roman miles, meaning about 5,000 kilometers. 8. According to recent studies, Nero didn’t actually set Rome afire. 7. The Roman soldiers used to bandage their wounds with cobwebs soaked in vinegar. 6. In Britain, the Romans built Hadrian’s Wall, which to this day stretches close to the modern border that delineates Scotland from England, covering roughly 130 kilometers in length. The wall is located entirely within England, with the Scottish border being closest at the western end. From the outposts of this landmark, the Romans kept the Pictish tribes of Scotland under permanent observation. 5. The snakes were considered to bring good fortune in Roman mythology, which is why they painted them on some of their walls. 4. When the Romans fell sick, they prayed to the gods for health recovery. If they would have recovered from a certain disease, they would usually leave a token of their gratitude in a god’s or a goddess’ temple — a little statue resembling that part of their body which just got recovered in the meantime. 3. Many Roman houses had guard dogs. A sign at the entrance of a Roman villa which had guard dogs always stood written: ‘Cave canem!’ which in translation means ‘Beware of the dog!’. 2. The tall buildings in Ancient Rome were so unprofessionally constructed that, at times, many of them quickly fell apart. 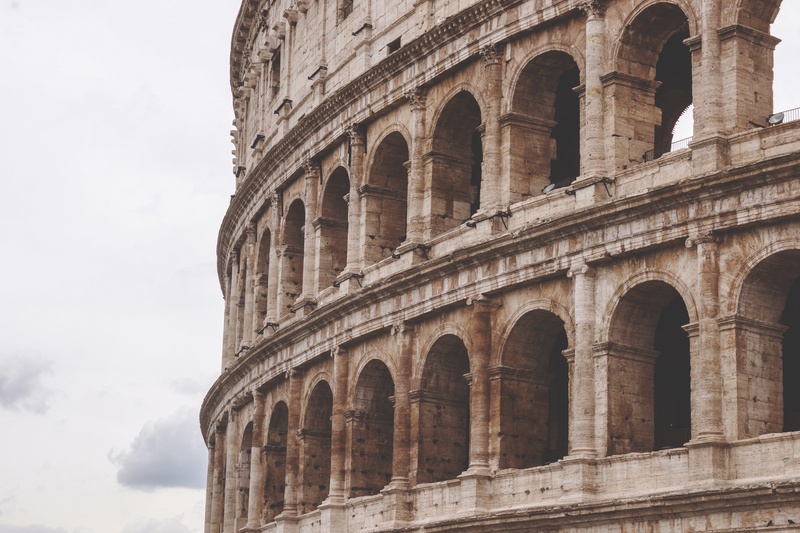 In order to avoid further accidents of this kind, emperor Augustus issued a law which prohibited the construction of new buildings that would surpass 20 meters in height. 1. At the richest Roman feasts, most guests could not consume all the food products and beverages served. To solve up the problem, they would usually get outside provoking themselves to vomit using feathers on their throats. They even had a separate chamber for that called ‘Vomitorium’. However, this is nothing more but a mere misconception regarding the Roman culture, since the ‘Vomitorium’ represented an exit from a theatre.